Every Sunday from 12.30 – 2.00pm ish all year round (followed by a cuppa). Summers: some Wednesday evenings for extra watering. A bi-annual street festival in Wandsworth Town, where local traders bring their wares out on to the streets, for a fun day. The alternative festival to the Chelsea Flower Show, showcasing innovative, creative ideas in local London gardens. We’ve got lots happening: wildflowers, hops and lavender, a small fruit orchard, a herb circle and raised beds and always a multitude of different flowers. Along with experiments like wicking raised beds to solve our water issues. 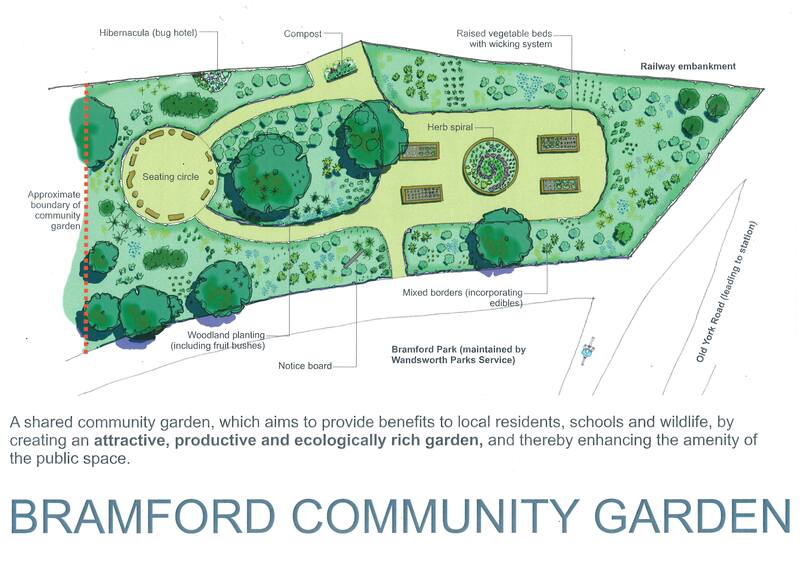 Here’s the original design from co-founder, Landscape Architect, Steve Frazer. 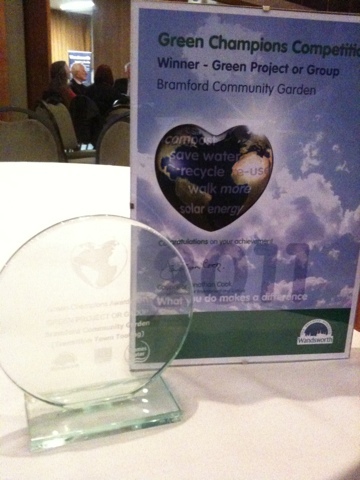 We won the 2011 Green Champion Award for a Group from Wandsworth Borough! Very proud. 2011 was our first full year of gardening at the garden and it’s changed dramatically since we started. We hope to encourage more local residents to get involved in growing food and flowers, and making this part of London a haven for wildlife as well as a useful, productive piece of land. 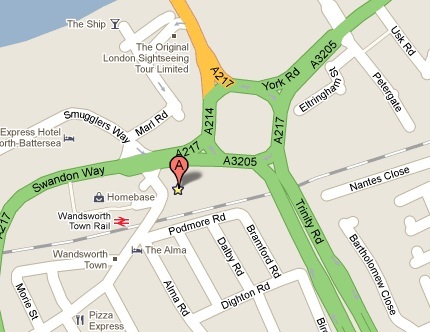 Over 500m2 of unused land in central London, Bramford Gardens is situated within a few metres of Wandsworth Town train station, opposite the glorious landmark which is the Wandsworth Gyratory roundabout!